Serving up a big bowl of angry stew, Gareth Evans' Apostle is a kinetic exercise in British folk horror. Full disclosure: I confess that I'm only vaguely familiar with the sub-genre. Watching the filmmaker's latest effort unfold on a big screen during its world premiere at Austin's Fantastic Fest -- sorry, everyone else, you'll have to wait until October 12, when it debuts globally on Netflix -- I was reminded simultaneously of Joko Anwar's Modus Anomali and Ben Wheatley's A Field in England, movies that are atypically creepy and disturbing. British folk horror is "a very specific sub-genre," Evans told me the day after the screening. "What I love about it is that there's enough that's grounded in reality, but then there's just something about the aesthetic, something about the behavior of the people ... it's a little bit askew, a little bit to the left, rather than just being linear normal. It makes you feel unsettled; the rules don't apply. It's similar to what [Sam] Peckinpah did with Straw Dogs ..."
You know something's not quite right? "Exactly," said Evans. "You're just not sure what it is. You feel like an outsider. So that's what was interesting to me. The aesthetic quality of those films, and finding a way to weave that into the story we were telling." Dan Stevens stars in Apostle as a man who ventures to a remote island in search of his sister in the early years of the 20th century. The island is under the thrall of a religious cult whose tenets are not entirely traditional, led by Michael Sheen. How do you create an environment in which horror feels like a natural outgrowth? "It was important for us to land those elements early," Evans said. "If it was a third act reveal, you might have the audience questioning at a point when you don't want them to wonder what that means. ... There's a propulsion of energy that needs to keep going at that point. "For me, it was always something I had to drip feed pockets of it," Evans noted, pinpointing a specific early moment (which only makes sense if you've seen it, so I won't describe it). His goal was for the audience to see that there is an "otherworldly presence in the story. I don't know what it means yet, but it's absolutely fine to not know what it means yet, because it will start to blend in with our normal storyline -- if you can call it normal!" Evans is currently in pre-production on a TV series for HBO's Cinemax and Sky Atlantic which was announced last year. Provisionally titled Gangs of London, it's a modern tale of power struggles among international criminal gangs and will start shooting in the next two months. He flew in for the screening, arriving shortly beforehand -- maybe an hour! -- and flying right back on Saturday afternoon. Despite the breakneck 24-hour trip, he remains a kind and generous soul who is only too happy to credit others for their work on his productions, including cinematographer and longtime collaborator Matt Flannery and composers Aria Prayogi and Fajar Yuskemal. Apostle has a wonderful, pulsing rhythm to it from the outset. Since Evans has edited all his own films over the years, I wondered about his process nowadays. "In the pre-production process, myself and Matt Flannery usually sit down and figure out a foundation for what the shot list will be," Evans explained. "It's not the end-all and be-all; it's imagined blocking. When you bring the actors on set, they might not want to stand next to the fireplace like we hoped they would. "Then you find yourself in the position where you're saying, 'It would be great if they stand next to the fireplace, that light would really bounce off his face lovely ... '" and then the actor says: "What a great idea!" During production, Evans edits in his head, and that's helpful for Flannery, "since he wants to know where the cuts are as well, so he can understand the psychology of the camera movement, and that's he's not going to do something that's just wasted, that won't be used. Then we figure out from there." "Other instances," the filmmaker continued, "it helps when we're on set." He cited a specific sequence, originally scheduled for a full day's filming with an extensive shot list, but then sliced to just two or three hours. Evans and Flannery had to think on their feet. Over lunch, they devised a plan to do 10 takes, one after another, consisting of freewheeling tracking shots of the entire sequence following a different character each time. Evans watched and took notes, mentally editing the shots as Flannery shot them. "That's the benefit of having the relationship with Matt," he readily acknowledged. "We can lean on those little tricks to help us get out of tight spots when the day is coming to an end." Having shot his previous films, including Merantau, The Raid, and The Raid 2, in Indonesia, where shooting days can run very, very long, Evans became very much aware of the differences when filming in the U.K. "In Indonesia, you finish [each day] when the scene's finished; in the U.K., you finish when they tell you that you're finished!" When does music enter into the picture for Evans? Each of his previous films has featured a distinctive and varied type of musical score. "That's true, but it's the same composers [Aria Prayogi and Fajar Yuskemal]. I've stuck with them because they've been so integral to everything I've done. They brought something really unique to this film, which I really wanted. "I wanted to have composers who weren't familiar with British folk horror, so they could watch it and interpret it their own way and take a look at different influences. We used some Indonesian instruments as well. They created this incredible soundscape to tell the story where it would make you feel unsettled; it's atonal in places. "It's such a joy to work with them. Their work has evolved to such a degree now and I'm just excited to keep pushing them to different categories." Finally, I wondered if Evans had ever considered a remake, mentioning John Carpenter's They Live, a film that Evans has spoken about warmly in the past. "A remake?! If I was ever to do a remake, it would have to be of a film that I felt had a cool concept but didn't quite realize it. I would never touch They Live. How do you best the Roddy Piper/Keith David fight ... you can't top it! "If there was something I felt I could bring something new to, a fresh take on it, then maybe then. But something like [They Live], it's a slammed door forever." 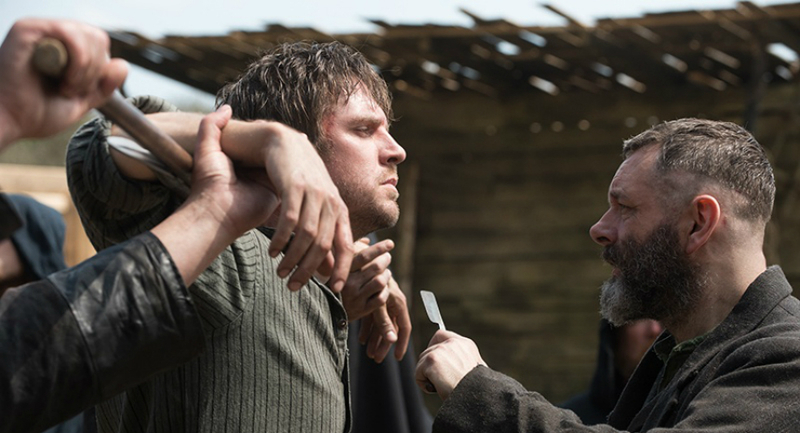 Apostle will debut on Netflix on October 12. Check out our previous interviews with Evans in March 2012, after The Raid debuted in the U.S.; and in April 2014, after The Raid 2 screened in New York for the first time.